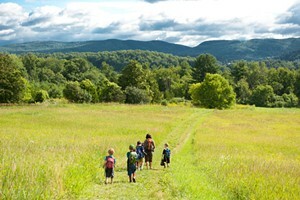 Home Front | Use Your Words | Kids VT - small people, big ideas! At midnight on New Year's Eve, my husband and I and our three boys were at a party with friends. While everybody was blowing party horns to celebrate the new year, Matt and I exchanged half smiles. It was one of those moments when each of us knew exactly what the other was thinking: We'd be spending this year very differently from everybody else in the room. Matt is a first lieutenant in the Vermont Air National Guard. He recently headed overseas for his first deployment. My husband had always wanted to join the military, but for years he sacrificed his dream so I could achieve mine — staying home with our three boys, now ages 8, 9 and 12. Four years ago, it was his turn. After endless hours researching military jobs and nearby schools and housing, he joined VTANG. We moved our family here from Indiana to support him. Moving to Vermont was easy. We love the snow, and the boys took to skiing. I'm passionate about recycling and buying organic; I feel as though I belong here. We joined a wonderful church community. We bought an old house and began fixing it up. Vermont life is just what we had hoped it would be. Adapting to military life has been more difficult — for me, anyway. My husband has thrived in his job on base as an officer and engineer. And the boys think that having an Air Force dad is pretty darn cool, especially when they get to watch fighter jets take off or meet their pilots. It took me a while to learn the lingo. The first time I went to a gathering for military wives, everyone was tossing around terms like "OPSEC." I went home and Googled it. It's short for "operations security"; the fact that I need to be careful about what information I share, and with whom, is something else that's taken getting used to. Despite my ignorance of acronyms, everyone made me feel like part of the club. Ready or not, I was one of them. We always knew there was a chance that Matt would be deployed. But I thought it would come later. Much later. We had only lived in Vermont for two years when the ugly "D" word was first uttered. We did everything we could to prepare. I got ready to take over all the chores Matt usually handles, which include maintaining the house and the car, paying the bills, and filing our taxes, things I haven't done since I married him 14 years ago. We took care of all of the legal aspects — for example, I needed power of attorney in Matt's absence. We wrote up our wills. He needed immunizations, specific uniforms, personal items to be shipped. There was emotional preparation, too. We decided to go to counseling together as a family. Though I felt very unsure of my new place as a military wife, I wanted my own job to do. So I took on the role of lead volunteer for our Family Readiness Group, which means I oversee family support for our squadron. I may not yet be fluent in military-speak, but I can call to check in on another wife or someone's mom. We prepared our boys by involving them in events with other military kids and by explaining the important work Daddy would do to serve our country. 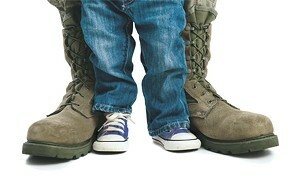 We all understood that we had a job as a military family, and we were ready and willing to do it. Until the day came for him to leave, and we changed our minds. He couldn't go. Of course, he had to. We said tearful goodbyes and prayed that he would be safe. Nothing can prepare you for the moment your husband walks away from you, out of the safety of your loving arms, on his way to a war-torn country. Leaving the airport that day was the hardest thing I've ever done. In the car on the way home, the four of us confronted our new reality for the first time. Forgetting for a moment that Matt wasn't with us any more, one of the boys said, "Hey, Daddy..." The rest of us fell silent as we remembered the many months and many, many miles between us. Can we do this? Can we be the kind of family that grows stronger while facing adversity, fear and separation? Can we make Vermont and the entire country proud? We're not sure. But our very own hero is somewhere way across the ocean giving it his best shot, so we will, too. Follow Tasha and her family on their journey as she blogs about the challenges and triumphs of deployment life on the Kids VT blog.